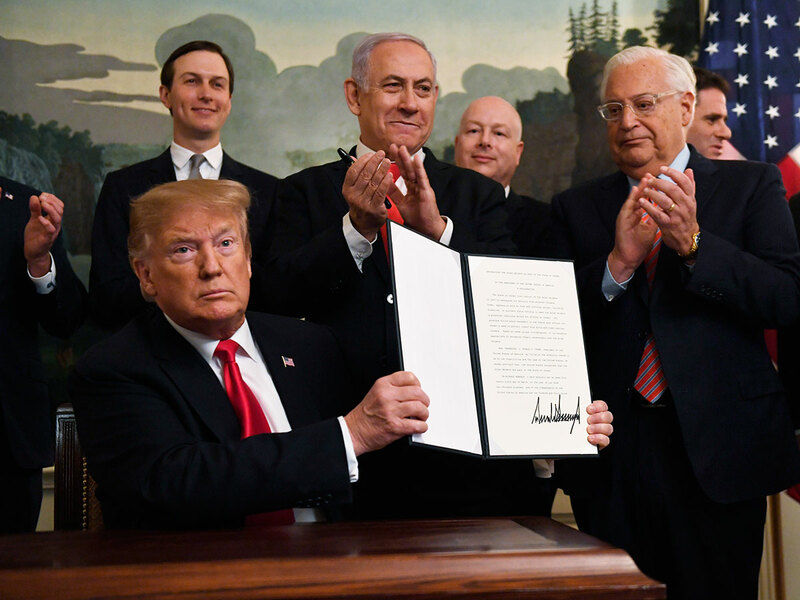 President Donald Trump signed a proclamation on Monday recognising Israel's sovereignty over Occupied Golan Heights, reversing more than a half-century of US policy. Arab League Secretary-General Ahmed Aboul Gheit condemned US President Trump's recognition of the Golan Heights as Israeli territory, saying the decision does not change the area's status, according to a statement published by Egypt's state news agency MENA. Israel annexed the Golan from Syria in the 1967 Mideast war; its sovereignty over the territory is not recognised by the international community. "Today, aggressive action by Iran and terrorist groups in southern Syria, including Hezbollah, continue to make the Golan Heights a potential launching ground for attacks against Israel - very violent attacks," Trump said. "Israel is responding forcefully to this wanton aggression," said Netanyahu, who planned to return to Israel to manage the attack following his meeting with Trump and other US officials, including Vice President Mike Pence. In a speech earlier Monday, Pence said the rocket attack "proves that Hamas is not a partner for peace." Pence told the American Israel Public Affairs Committee that "Hamas is a terrorist organisation that seeks the destruction of Israel, and the United States will never negotiate with terrorist Hamas."